Summer is a romantic season, complete with sun-flushed cheeks, rejuvenating vacations, and an explosion of fruit. But it has a dark side. Dehydration, sun damage, stinky armpits. This is REAL summer. Jokes aside, we’re here to talk about staying healthy this summer. We’re bringing you some of our best tips and DIY recipes to keep your skin clean, safe, and looking amazing this summer. 1. stay hydrated. Really hydrated. No better way to stay hydrated than by keeping a water bottle on you! I don’t know about you, but I have a better success rate with some water bottles than with others. The wrong sized mouth can leave me with more water on my shirt than in my body. Others open and spill in my bag, resulting in an unhappily soggy cell phone situation. Staying hydrated is the key to summer beauty (and beauty in general), so a less-than-ideal water bottle just won’t cut it. Find a water bottle that works for you, and don't get caught without it! Place lemon, cucumber, and basil leaves in a pitcher, and then pour the water into it. Let the ingredients mingle in the refrigerator for at least an hour before enjoying. It’s summer; you’re at your sexiest! Your skin is dewy, your hair is sun kissed, and you are WEARING that summer dress. Except, oh wait, you smell terrible. Or you smell okay, but it’s because you're using unnatural, unhealthy deodorant. We recently blogged about common ingredients found in skin care that should be avoided. Second on the list was aluminum, an ingredient in most deodorants you find on the shelf. If you haven’t already, it’s time to make the switch to something free of toxic chemicals. Our first tip: eat fenugreek! This plant has the amazing ability to make your sweat smell like syrup. It sounds crazy, but it’s true. A popular way to reap these benefits is by eating the sprouted seeds. To sprout, soak seeds in water overnight, or for about eight hours. Drain out the water, then rinse and drain seeds once or twice a day, for three days. Sprouts can be thrown in a salad, added to a sandwich, or even eaten alone. (I like them with honey mustard.) You will soon notice that your sweat is sweeter! Combine all ingredients in a fine-spray mist bottle, or store in a glass jar and apply with a cotton ball. 3. Protect your skin from environmental stressors. Of course, protecting your skin from the sun is mandatory. So use a good natural sunscreen. Try our Sun Love Natural Sunscreen formula if you're looking to protect while staying away from scary synthetics and chemicals. If you’re looking for a natural way to lighten the appearance of your skin, here’s a delicious face mask recipe from Beauty Banter. Lemon and honey both help lighten, while banana nourishes and creates the perfect mask consistency. Mash up banana in a bowl, and then add honey and lemon juice. If you are using oats as well, add them in and let the mixture sit for 10 minutes before you apply. Use this mask on clean skin, and let it soak in for 15-20 minutes before washing it off. If you’re feeling drier than normal, coconut oil is your best friend. Known to soothe, it's also a good oil to use after you've been outside. If you are oilier than normal this time of year, hazelnut oil will moisturize without making you greasy. It also has properties to keep any oily skin patches you may be experiencing in check and can minimize the appearance of large pores. This one can work well for a broad spectrum of skin types. What makes this oil perfect for summer is that it reduces water loss without completely blocking the transportation of vapor and gases. This helps your skin look firm and taut. Not only does it smell amazing, but it promotes wellbeing! It is a good choice for those with oily skin, but it also works well for dry skin types. This earthy smelling oil is stimulating and helps with dry skin (which is why we put it in our Anti-Aging Facial Oil). The high vitamin C and antioxidant content of this oil make it a great anti-aging oil. We raved all about it in a post last year. Your summer beauty regimen is not complete without fresh juices. We love drinking juice throughout the year, but summer’s certainly the best time for juicing. Why? 1. Antioxidants in fresh squeezed juice help protect from environmental stressors. You need more antioxidants when you spend time in the sun. 2. Tis the season of fresh produce! Summer brings an abundance of fruits and veggies, so take advantage and buy what’s fresh. 3. Many people find that they are less hungry during warm months due to lower metabolic needs (your body normally spends a lot of energy warming itself up). Experiment with replacing a meal a day with a juice, and see how you feel. Kris Carr is our juice muse. 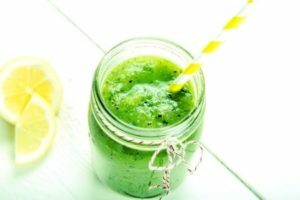 She not only transformed her life by incorporating green juices and other healthy foods into her life, but she has helped thousands of others do the same! And she does it all with humor. Wash all produce and send it through your juicer. Sprinkle the wheatgrass on top. When it comes to summer beauty, keep it healthy! Sun protection is not optional and hydration is your job. A big thanks to the Home Shopping Network for inviting us to write this post. Here’s to a safe and stylish summer! What are your recipes for natural summer beauty? Share in the comments!